by Yasaman K. Yazdi and Niayesh Afshordi. Niayesh Afshordi and Yasaman Yazdi discover that firewalls have consequences. Yasaman K. Yazdi is a PhD candidate at the University of Waterloo and the Perimeter Institute for Theoretical Physics. Niayesh Afshordi is an associate professor at the University of Waterloo and the Perimeter Institute for Theoretical Physics. Thought experiments highlight the edge of our understanding of our theories. Sometimes, however, we can get so caught up in heated debates about the solution to a thought experiment, that we may forget that we are talking about physical objects, and that an actual experiment or observation may give the answer. 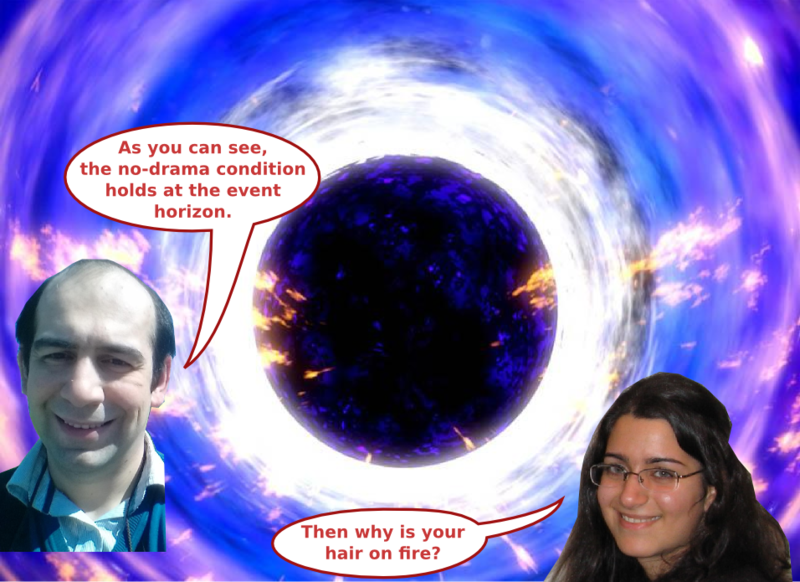 In this Insight we discuss a proposed solution to the black hole information puzzle, and a possible observational signal that might confirm it. The black hole information loss problem is a decades old problem that highlights the tensions between some of the pillars of modern theoretical physics. It has evolved from being a problem to a puzzle, and currently still remains a deep mystery. The principles which are at tension with one another are 1) the unitarity of quantum mechanics, 2) the equivalence principle, 3) the validity of quantum field theory beyond a Planck length away from the horizon, and 4) the dimension of the Hilbert space of a black hole being exp(A/4). If all four of these principles are held onto, contradictions have been shown to arise. For example, a state can be shown to be maximally entangled with more than one other state (one on either side of the horizon), thus violating the strong sub-additivity of entanglement entropy. There is disagreement within the physics community regarding which of the principles to relax in order to evade such contradictions. A popular route taken by many physicists is to drop the requirement of the equivalence principle (also known as the “no drama” scenario) at the event horizon, and to replace the event horizon with something more exotic (and more dramatic!). Ahmed Almheiri, Donald Marolf, Joseph Polchinski, and James Sully (AMPS) recently proposed for a “firewall” to replace the event horizon, as a resolution to this puzzle. The idea is that any observer that reaches the firewall would burn and not be able to cross to the other side. If they cannot cross to the other side, the contradictory scenarios such as the one mentioned about entanglement, would no longer arise. There is no concrete model for a firewall yet. It is just the idea of something being there which creates an impasse. There are also some other more concrete realizations of event horizon alternatives, such as fuzzballs motivated by string theory. Whether or not this is the right solution to the black hole information puzzle, a nice feature of pursuing these scenarios is that event horizon alternatives will have observable signatures! In our latest work, we explore one such observable signature, in the form of a neutrino spectrum. Replacing the event horizon of a black hole with some exotic alternative (which we will collectively call firewalls) may have observational consequences that would distinguish them from classical black holes. Firewalls could for example emit radiation to the outside universe. This is because a firewall would be a surface that accreting particles can scatter off of, and it will have some characteristic spectrum that we can observe. In our CQG paper we construct a phenomenological model to describe and constrain the nature of this radiation and its spectrum. We expect the radiation to mainly consist of neutrinos, because firewalls share similar radiative properties to core-collapse supernovae. In these situations neutrinos can travel further unimpeded compared to photons in the surrounding matter and therefore carry out the energy more efficiently. We also make the interesting proposal that accretion onto firewalls could be a possible source for the high energy (PeV) neutrinos recently detected by IceCube. The source of these neutrinos is still a mystery, and several candidate sources have already been ruled out or strongly constrained. We show that if the neutrino spectrum from black holes obeys a power-law (expected from a gravitational Fermi acceleration mechanism) and the black hole accretion has a reasonable efficiency, then it fits the observed IceCube spectrum quite well. In our future work we will do more detailed modelling of the neutrino emission spectra and compare it with IceCube’s future data. If the neutrino spectrum continues to agree well with IceCube’s observations, we would kill two birds with one stone, or with one neutrino spectrum. This entry was posted in Author Insights, IOPselect and tagged black holes, quantum gravity by David Jones. Bookmark the permalink.